At Vermont Woods Studios, we work with some of the most talented and respected furniture and home decor craftspeople in the state of Vermont. The Green Mountain State’s historical values of sustainability and high-quality craftsmanship have propelled a movement that has positioned Vermont as the fine furniture capital of the world. Their products are made in Vermont (POLYWOOD outdoor furniture is an exception), but everything available at Vermont Woods Studios is 100% American made. Copeland and Lyndon both employ over 100 people in the state of Vermont. VFD and Maple Corner are smaller at around 10-15 in their respective workshops. We've also partnered with several smaller shops to produce one-of-a-kind custom artistan furniture. If you're curious about artisan furniture, contact our sales team to get a fresh catalog of our in-stock items. Each workshop has different techniques for building and finishing furniture, and each one produces uniquely designed collections. Founded by master craftsman Arthur Weitzenfeld in 1970 and now co-owned by his studies Adam Blaisdell and Rob Bachand, Vermont Furniture Designs produces some of the highest quality furniture in the state. 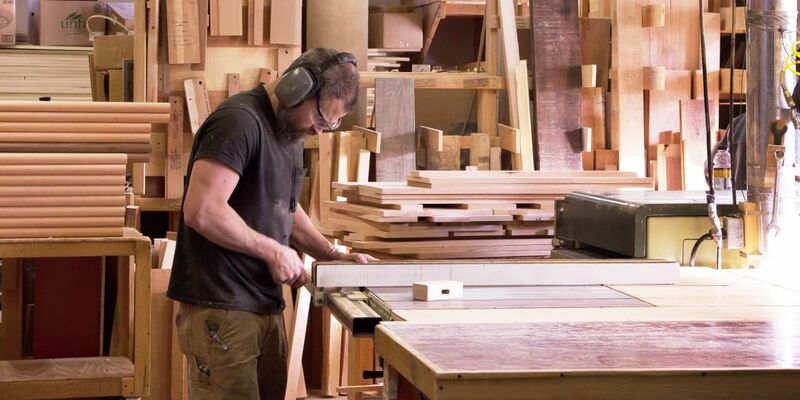 VFD uses native cherry, walnut, and maple to produce designs emulating several different furniture styles including shaker, mission, modern, mid-century, and traditional. Adam & Rob’s team use a traditional linseed oil finish on their wood furniture. While oil finishes do require some maintenance, it also makes repairs easier, as oiled wood can simply be spot-sanded and re-oiled rather than stripped entirely of the finish. Oil finishes also bring out more depth and color within the wood grain, which makes them the go-to option for those who truly appreciate the natural beauty of wood. Because oil finishes are susceptible to water stains, VFD applies a thin layer of wax to their products before they leave the shop. Robin Chase, the founder and master craftsman at Maple Corner Woodworks, is a true visionary when it comes to furniture design. It’s easy to see how this quaint workshop nestled in small-town Vermont consistently produces some of the finest furniture made anywhere in the world. Striving towards and adhering to the highest standards in quality, consistency, and design, Robin’s creations are uniquely his own. The MCW team finishes their wood furniture with a non-toxic, zero VOC linseed oil. Several coats of polyurethane oil are then applied by hand to the tops of tables and case-goods to add additional protection against water and scratches. Many consider Robin a generational woodworking talent, and it is not uncommon for us to fill an entire house full of his work. Copeland Furniture is one of Vermont’s most recognizable high-end furniture brands. Since 1976, Tim Copeland and his family have been building a reputation for world-class furniture in a variety of crisp, clean designs. The Copeland Furniture factory is powered partially by a large solar field and is home to ~100 full-time employees and lots of modern machinery. Unlike our other workshops, Copeland Furniture does not entertain customizations to their designs. However, this allows them to further standardize their processes and minimize lead times. Copeland offers several of their designs as Quick-Ship items, meaning they’ll ship within 1-3 weeks- a significantly shorter lead time than typical made-to-order furniture. In addition to the stain options available on different woods, Copeland offers two versions of its’ post-catalyzed conversion varnish: the standard option as well as a low sheen option. Contact us to learn more about Copeland’s wood finishes or order samples below. We are the only Copeland retailer we know of to offer our customers a lifetime guarantee on their furniture. It doesn’t make sense to buy Copeland anywhere but here. Here’s 10 reasons why. The story of Lyndon Furniture is as good a reflection of the history and values of Vermont as you’ll find anywhere. After Dave Allard graduated high school in 1976, he began working on his family farm. He built his first few pieces of furniture in a house that he built himself for his parents to move into. After furnishing that house, he set his sights on building a new workshop. He built his first woodworking shop in Lyndon, VT from timber he cut down on the family farm and milled locally. Lyndon now employs over 100 craftsmen in Vermont’s Northeast Kingdom. Their furniture is made with real solid wood and built to last a lifetime and then some.